Every dermatologist I’ve ever spoken to is adamant that we should all be wearing an SPF all year round. I did this for many years but in recent years I must confess I’ve let it slide. I mean I live in England for heavens’ sake. The winter is long and the skies are too often grey. And what about this world wide epidemic of vitamin D deficiency? Surely if the sun makes a wan wintry appearance we should be exposing as much naked flesh towards it as possible? The fact is that UV rays are still present in the winter even on a cloudy day. UVA rays are believed to be just as strong in winter (although I’ve read some conflicting reports on this) and cause wrinkles and ageing. UVB rays cause sunburn and both types are linked to cancer. I do think a modicum of common sense is required though. If it’s cold and grey and you spend most of the day indoors, then you probably don’t need an SPF. I also believe a small amount of sun exposure is beneficial and the sun is not to be avoided completely. However protection is still needed for a good deal of the time. If, like me, you spend sometime each day walking outside or pounding the pavements, then it’s probably a good idea to protect your skin, specially on a sunny day. Even though you won’t burn in winter, damage from UV rays are accumulative. You may not see any difference day to day but the chances are your skin will age faster. And do remember that if you are surrounded by snow, those UV rays will be reflecting up a storm. And the higher you are (mountain skiing) the stronger they’ll be, comparable to a day on the beach. During the warmer months, from March onwards, no matter what the weather, an SPF is vital. I therefore set myself the task of finding the best natural moisturisers without any of the nasty chemicals that also contain an SPF. There are lots of tinted moisturisers, foundations and mineral foundations that contain an SPF but I like to have it in a moisturiser to make sure I wear it every day. As for the vitamin D dilemma, I cover myself by taking a vitamin D3/K2 combo. I wasn’t sure I would find many natural choices so was thrilled to discover that there was in fact, a huge amount to choose from. There really has been an explosion of natural and organic products in recent years and the only problem is where on earth to start. I’ve done the experimenting for you and have come up with a choice of 4 that are all quite different and all top notch. They address different aspects of the skin and I love them all! I love that this one is for the face AND the body. In the summer that’s a big advantage as you can put some on your exposed arms and hands which will also need protecting. However, I also think it’s good for the winter as it’s light but super moisturising. I consider SPF 15 to be perfectly adequate for an English winter although some dermatologists will recommend SPF 50 year round. The problem with this is that most SPF 5o products will contain high levels of chemicals (and seems like overkill on a grey wintry day). In the summer in the UK I think SPF 15 is probably fine as well unless we’re going through a heatwave and getting lots of sun in which case I’d go for SPF 30. Antipodes uses a physical barrier of zinc oxide for protection but also contains lots of other great products. Anti-oxidant plant extracts and hyaluronic acid and ancient reishi mushroom ensure firm, hydrated skin. I was unfamiliar with this brand but am so enthralled with this product, I intend checking out the entire range. Firstly it smells like heaven. It not only protects from UV rays but also protects against pollution which is a big plus if you live in a city like London (which has been given a warning by the EU as we speak for vastly exceeding allowed levels of pollution). It looks like a tinted moisturiser as it’s flesh coloured but this very light moisturiser disappears into the skin when applied. The wonderful aroma is designed to balance body, mind and spirit and encourages you to breathe deeply while taking a moment to yourself. And it smells so wonderful that’s exactly what you do. The phytonutrients repair oxidative damage and protect the skin while still allowing it to breathe. It’s on the pricy side but is such a treat I can’t recommend it enough. This rich moisturiser brightens your skin and reduces pigmentation, evening out skin tone. It uses zinc oxide ( as most of these natural products do ) to protect your skin from the rays and contains Vitamin C, green tea, olive and stem cells from the Madonna Lily plant. This is great, if like me, you have lots of freckles and brown pigmentation spots from previous bouts of devil may care sunbathing. It’s very nourishing so is probably not ideal if you have oily skin. Perfect if your skin is more mature, dehydrated or very dry. This is a light but nourishing, fabulous moisturiser. Very hydrating, full of protecting anti-oxidants and smells great. Because its SPF 30, it’s perfect all year round as will do the trick on a hot summer day as well. It’s such a wonderful moisturiser I would use on it’s own even if it didn’t contain an SPF. What do you think of Green People’s scent free Facial Sun Cream. SPF 30 high. 78% Organic. I know you have used Green People’s products before. I rate all their products very highly. However this one is specifically for sun exposure (and I would highly recommend for this purpose) as opposed to a daily moisturiser. 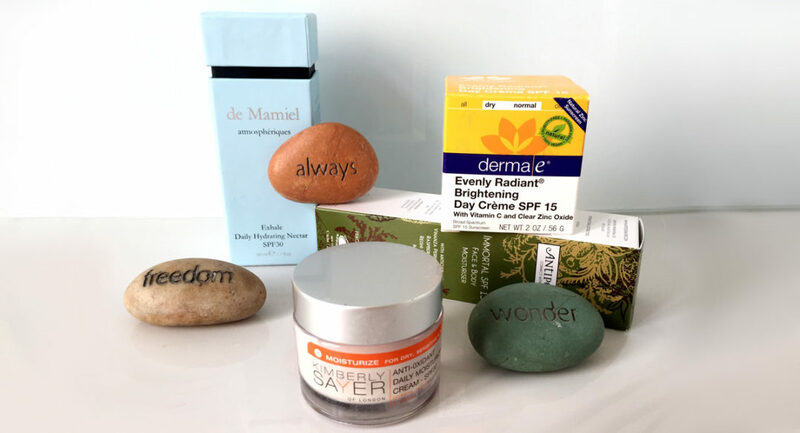 Check out my article about chemical free foundations! I found some really good ones. I love the Kimberly Sauer moisturiser. After my scare with skin cancer a tried so many brands in search of the perfect high SPF moisturiser, and this one was my favourite! The de Mamiel seasonal oils are absolutely fantastic! Highly recommend. I absolutely love that range!